Pour this mixture over the oats and combine thoroughly using your hands. Make sure all the oats are coated well. 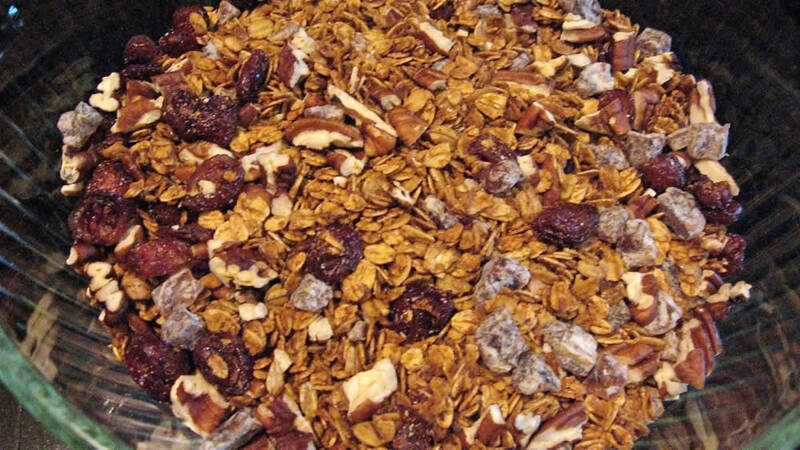 Granola after baking. Parchment paper is awesome. Spread in a thin, even layer on a baking sheet covered with parchment paper. 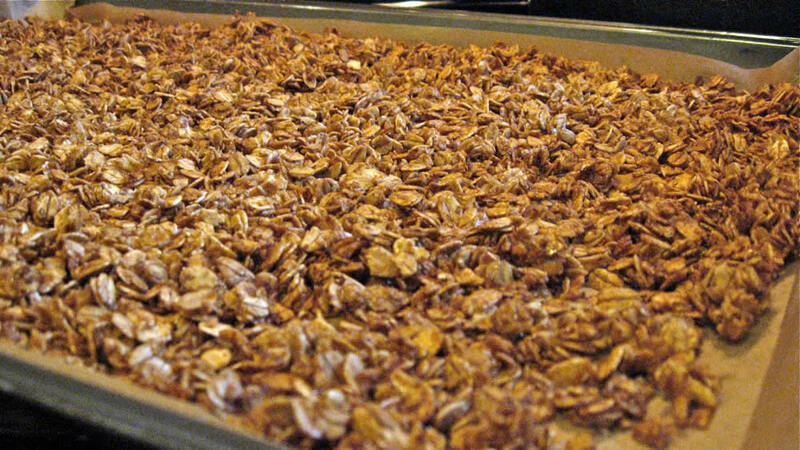 Bake, stirring after 15 minutes, until the granola is a light golden brown, usually no more than 25-30 minutes. 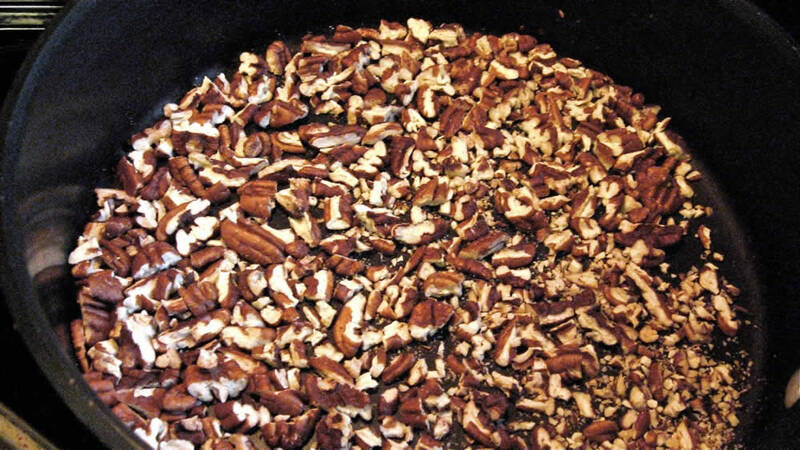 My favorites: pecans, walnuts, or hickory nuts, combined with blanched almonds (slivered or sliced). Toasting nuts, without oil, in a heavy skillet. Once the granola is in the oven, put an iron skillet on medium-high heat and dump in enough nuts to cover the bottom of the pan. Keep stirring the nuts to prevent burning. They usually take about 15 minutes, so they’re done about when you need to stir the granola. The almonds make good canaries; when they’re starting to turn brown, go ahead and empty the nuts onto a plate to cool. Chop the nuts into smaller pieces, either before or after toasting. This helps them stay mixed in with the oats. After removing the granola from the oven, let it cool completely. You can stir it around if you don’t want it to stick together, but it’s also fun to break it up later. Once the granola and the nuts have cooled, combine them and toss in some extras like dried fruit, toasted coconut, etc. Cranberries and raisins are always good choices, but I keep meaning to get some dried cherries. Today’s batch got cranberries and chopped dates (with added dextrose — it was an impulse buy). Store in an airtight container and eat within two weeks (though it probably it won’t be around that long). Thicker, high quality oats hold up better than cheaper store brands. Right now we’re using Thick Rolled Oats from Bob’s Red Mill. I bet their Organic version would also be good to try. Just make sure you don’t use instant, quick or “minute” oats. I’ve used cheaper oats, but they tend to break down into crumbs. Still, you may find the thick ones to be, well, too thick. The original recipe that I found uses twice as much sugar, and no molasses. Granola is pretty flexible, though, so experiment. For the sake of comparison, I just happened to buy a package of Bob’s Red Mill “No Fat Added” Granola, and they don’t use any oil at all; it’s definitely more dry than my version, but still very good (and I think they’re using thick oats as well). Depending on the ingredients you choose, granola is so easy and inexpensive to make that you’ll wonder why you didn’t try it sooner. Finished granola, with dates, cranberries, and pecans. two weeks?! it will not last that long! !